My mom believed in comfort food. It was her cure-all, suitable to calm anxieties, ease emotional pain, distract from pressure, and reassure her little girl. I grew up believing in comfort food. My mom and I both found it soothing. It eased our relationship. I still find food soothing. Nothing eases the tension of a close NFL game like heavily buttered popcorn. Butter during football games helps. Butter between games, however, just makes my clothes fit tighter. It also lets me avoid dealing with issues. So does pasta with alfredo sauce and a side of garlic bread. Food promises to calm my anxieties, ease unruly emotions, distract me, and reassure me. But its comforts don’t last. And that’s the problem. Comfort food is a lousy comforter because its promises fade away. It fills my stomach but leaves me personally empty. As I was pondering my cravings a few days ago I asked the Lord to show me a better way to gain comfort. And so He did. Suddenly I started thinking about places in the bible where God was involved with food and drink: He told Adam to eat every food that He provided (Genesis 2:16); He showed Hagar a needed well (Gen 21:16). Jesus offered a Samaritan woman living water that would forever quench her thirst (John 4:7-15) and urged a crowd to eat living bread (John 6:51). True, living drink. True, living food. That’s what Jesus says He is (John 6:55). What is Jesus doing? He’s urging the crowd to eat and drink Him. The Spirit urges me in the same direction. He tells me – and you – to eat and drink Jesus. Really? 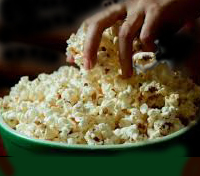 Fill our empty, anxious places with Jesus instead of buttered popcorn? Yes. Ease socially awkward moments with Jesus instead of more turkey and another piece of pumpkin pie? Also yes. That’s intriguing – as a concept – but how do I do it? How do I eat and drink Jesus? I have no idea. But wait, maybe I do. Maybe it’s something I’ve known for years but never connected to comfort. Maybe it’s receptivity. I think it is. I’m used to practicing receptivity with my physical senses. I taste a flavor or feel a touch; sound enters my ears and light enters my eyes; I inhale an odor. Sensation after sensation moves into me, and I sense each entrance. But receptivity isn’t limited to physical senses; it works with non-sensory experiences as well. Have you ever been drunk with pleasure or felt the coldness behind someone’s smile? Tasted the sweetness of a victory or smelled a trap before it was sprung? Sure you have. So have I.
I take all kinds of experiences into myself. So how do I take the experience of Jesus into myself? I learn to do with Him what I already know how to do with buttered popcorn. Comfort food leaves us personally empty. Jesus gives food that fills us & lasts. I’ve started practicing. When I’m drawn to the quick fix of comfort food, I look (in that moment) for food that lasts. I feed myself truth (for Jesus is truth). I picture myself in scenes God tells me are real: Him surrounding me with His shielding presence (Psalm 5:12); His hand pouring out a blessing until it overflows (Malachi 3:10). I slow down and receive experiences into myself; I thank God for the gifts He shows me. I open wide my spiritual senses. As I practice, I find myself becoming more aware of Him. And I am comforted. Jesus feeds me real comfort food: Himself. His food calms my anxieties, eases emotional pain, relieves pressure, and reassures me. And it lasts. Jesus comforts better than butter. The idea of opening wide one’s spiritual senses is so appealing. And a little daunting. Lynne, good info. I need to remember this when I reach for the cake or fried (insert name here). You got it! Have a great Thanksgiving.